COME ONE, COME ALL! 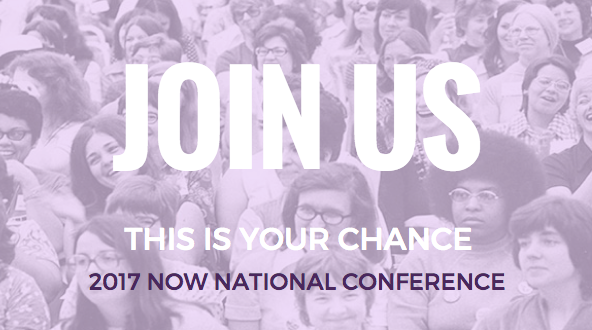 WE WANT YOU (YES, YOU) TO JOIN US AT THE NATIONAL CONFERENCE IN ORLANDO. This is an incredible opportunity to see NOW on a national level and to bond with other Tampa members. Come learn what NOW is really about and meet feminist leaders from all around the country. You can register for the conference here. If you have not already registered for the conference or are unsure of whether you can attend the conference, be aware that you can register for the conference on site. There is a recommended price for conference admission, however the cost of admission is "pay what you can." Simply indicate the amount you are able to pay at checkout. We hope to be able to organize our members at the conference for updates. We have put the following schedule in place for members attending the conference. If you plan to attend the conference and would like to connect with other members attending, please email us at TampaAreaNow@gmail.com. 12:45PM: Tampa NOW members meet in the hotel lobby and proceed to the food court to eat together. 7:30PM: Tampa NOW members meet in the hotel lobby to proceed to dinner. 8:30PM: Tampa NOW members meet in the hotel lobby to discuss Saturday work sessions. 10:00AM: Tampa NOW members meet in the hotel lobby after the morning sessions. 11:45-2:00PM: Tampa NOW members meet in the hotel lobby and proceed to the food court to eat together. 7:30PM: Tampa NOW members meet for dinner at Buco di Bebbo; a reservation has been made. If you would like to attend the conference and need help with transportation or rooming, reach out to our board at TampaAreaNow@gmail.com. We have some members who are willing to carpool and share rooms with others in order to make this a successful and meaningful conference weekend.